I wasn't sure what to expect when the Aerin fragrance brand launched in 2013, but after smelling the first five, I got the general drift. The latest two, Iris Meadow and Waterlily Sun, are in the same easygoing light floral mold as Lilac Path, Ikat Jasmine and Gardenia Rattan (the other two, Amber Musk and Evening Rose, had a little more heft). None of them are the perfumista-bait some of us had hoped for, but they're wearable enough, and I've come to think of the Aerin brand as a sort of mashup between the (early) Jo Malone brand and the (later) Guerlain Aqua Allegoria range: (ostensibly) material-driven, clean, youthful and easy to wear. 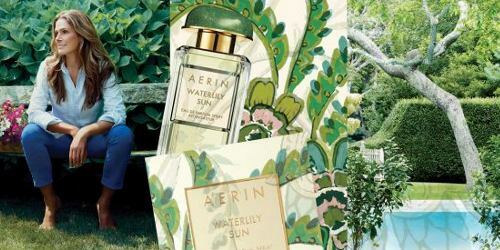 The bonus factor, I suppose, is the casual-luxe "Aerin lifestyle", which seems to be the key selling point of the advertising. If Prada Infusion d'Iris was too much iris for you, Iris Meadow might suit your purposes (and if I'd paid more attention to the Eau de Toilette version of the Prada, I could tell you how it compares to Iris Meadow, but alas). The opening is light blackberry + citrus, the heart is a wisp of jasmine-ish floral, very soft and clean and transparent, and the dry down is a pale but warm musky woods. All of it is wrapped in a little veil of creamy iris powder. The lasting power is fine, but after about 30 or 40 minutes it smells oddly flat on skin. I found it competent but lacking in charm; of course, you might love it. I did not expect to love Waterlily Sun, and I don't — it's easily my least favorite of the seven fragrances so far. It's a green watery floral with tropical fruit accents, sharp (and loud) in the top notes, and sour in the dry down. I wore it three times, but the third time, I gave up and washed it off — it reminds me of stale air freshener. My overall favorite so far is Evening Rose, but the $110 asking price seems ambitious, and the timing of this new launch is a puzzle: both Iris Meadow and Waterlily Sun seem better suited for warm weather. Perhaps they're for cruise wear? 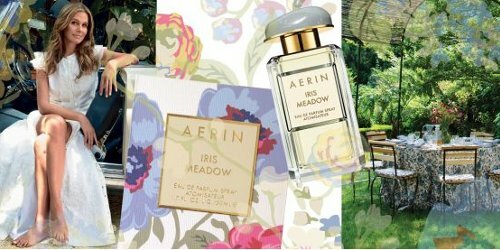 Aerin Iris Meadow and Waterlily Sun are $110 for 50 ml Eau de Parfum. There is now a limited edition coffret with 10 ml bottles of all seven Aerin fragrances for $130, and the brand has introduced matching body creams. Bwahaha “perhaps they’re for cruise wear?” I love it! Snarky, but all the same, seems in keeping w/ the brand in general. We’ll all need to book that cruise then! Oh and I’m off to watch Murder on the Nile! Not me, I have standards! It’s not bad. To me it’s just a lesser version of the Prada, but maybe someone will turn up who loved the Aerin & hated the Prada. I would wear Cococabana and Manoumalia, though not at the same time. That might prove too much, even for me. Bronze Goddess, IMHO, is better than any of the Aerins. Who knows what she wears, but can totally see Jo Malone as an inspiration for these…BUT, these cost $110 for 50 ml, and Jo Malone is mostly around $120 for 100 ml. And while I’m not a huge Jo Malone fan, there are scents in that brand that I have bought. Can’t see ever buying one of these, although who knows, maybe they’ll surprise me. I know at least one blog that actively prohibits putting any links into comments. I found it ironic that when I tried sharing this blog’s article on FB, in the automatically generated preview the snippet next to the picture was that warning message that those links will be deleted. Interesting, thanks — didn’t know. I will occasionally delete a link (more likely the whole comment) if it looks like obvious astroturfing, but that’s rare. We do require login so I guess that keeps out most trouble. I can’t remember the name of the perfume but it was something recent where I thought it was a strange time to be releasing a summer scent. I would be curious to know how/why that happens: was it a poor planning and/or mismanaged release deadline? Or was it intentional? Or maybe it doesn’t really matter for their sales (based on real numbers)? Honestly don’t know. Maybe they seriously are for cruise wear. Or maybe they don’t care, or maybe most consumers don’t care? But seems like they should have done 2 more in the spirit of the Evening Rose & Amber Musk, and saved these for April. I can only provide anecdotal evidence, but none of the scent wearing members of my family think in terms of seasons for personal scent. They do for candles and even hand soap, oddly. I would be willing to wager that is true for most consumers of scent, excepting summer. There is a steady release of “summer” themed flankers each year, but I don’t remember seeing many fall or winter themed flankers other than Kenzo Winter Flowers. Maybe the Givenchy Harvest flankers from years past would be considered fall themed? Or I could be forgetting a steady stream of releases, of course. Seasonal hand soap? I did not know. You’re right…fall flankers are rare…DKNY did one this year but didn’t even see it anywhere. There are holiday flankers but they’re rarely truly winter themed. The Method had soaps at Target have seasonal fragrances. Cranberry and pine for winter, I’m trying to recall what the summer ones were this year. Ah, well that jogs my memory. I bought a limited edition Silver Birch from them last year, plus one other floral (plumeria? something), hated them both (Silver Birch was a generic men’s cologne scent) and vowed to never fall for the prettily-decorated LE hand soap containers again. I like the Method Tomato Leaf soap. I think someone here enabled. B&BW has the pumpkin themed array of products for Fall – my favorite season! And I love their basil d/w liquid. Will look for the tomato leaf! I tried the Evening Rose and liked it while I could smell it. It totally disappeared about 10-15 min in. I think it must be a musk blocking issue. Otherwise, it smelled a lot like Delrae Bois de Paradise after 15 hours. That had me in stitches, those older Delrae’s stick around don’t they? They are whoppers! I totally respect the fact that DelRae really puts serious oomph into their frags. Amoureuse is almost as long-lived. I was thinking of Amoureuse as well. Easily my favourite Delrae. Lasts pretty well on me, so guessing that yes, some anosmia issue. “Delrae Bois de Paradise after 15 hours” really is funny, thanks! A mid-winter cruise would surely fit into the casual-luxe “Aerin lifestyle”. These completely remind me of Jo Malone and don’t appeal at all. I will say I like her style/look, and am drawn to the displays they have at the Lauder counters. Beautifully muted colors with a cape cod type of aesthetic. Her style/look sort of annoys me, but that was only really true after watching the commercials for these last two fragrances, which just seemed particularly like vanity pieces more than fragrance ads. Yeah, crazy gobs of money! Was just in Berdorfs on my recent NYC sojourn (the first in over a decade) and I was surprised at how mingy the Aerin display looked–small, darkish and tucked between two big bright displays. I didn’t sample any of the scents having just sold a kidney to make a purchase at the Guerlain counter, but now I wish I had just for a reference. And do tell us what you traded the kidney for! Husband, who generally tolerates my perfume hobby but is not particularly into the details, went full crush for Bolt of Lightning–even so far as to ask me to sniff the back of his hand about 15 times in the hours following our JAR visit! And the kidney? L’Huere Bleue parfum. To me, it is like being enveloped in the softest, warmest cashmere wrap, while sitting on a velvet upholstered window seat watching a pelting rain outside. Congrats on your L’Heure Bleue! The extrait is gorgeous. L’Heure Bleue extrait is worth a kidney! Great choice! Thanks for the reviews, these sound flat out boring and will pass. Ads are blah too. Too irritated to even give this line a try. The ads remind me of Tory Burch. Come to think of it, the whole brand reminds me of Tory Burch. Ugh, thank you! I can’t stand that whole obnoxious Tory Burch clothing line. It’s like Kate Spade meets Missoni, but really thoughtlessly done and no sort of creativity. Just not classy stuff. And those stupid flats with that huge stupid button cut-out…. Oof, sorry…. But just look at the “casual elegance” “mood board” ads, that’s Tory Burch all over, right down to Aerin Lauder’s bare feet. I find this brand really annoying. They seem to positioning themselves as a luxury brand based upon Aerin’s “prestige”, when they seem to be quite ordinary (and not particularly well lasting) scents. I don’t read enough fashion / beauty stuff, I did not even know she was well-known enough to sustain this sort of “aspirational lifestyle” brand. But I’m glad they did not do these under the Estee Lauder brand name. Your reviews, especially when you don’t love the fragrance, always give me a chuckle! Thanks, Robin. The names of these are very Crabtree&Evelyn like! LOVE the cruisewear comment! Bwaha! I got a set of these to try them. I don’t know, I can’t say that I love them, but as far as boring-ish florals go, they’re pretty nice. I’m not a huge fan of JM and these seems at least a little more interesting in terms of development. But, they definitely are for those who don’t want to delve into anything that might be considered even the vaguest bit overwhelming for anyone around them. Honestly, I think my mother (age 71) would love them (she’s always been a big floral fan and, though extremely sweet and loving and a wonderful grandmother, style is not her thing) and might give her the set on her next visit. Oh, do check out the coffret — I think it would make a great present!